With a macro lens, I can take a photo of an object that will show every detail that I would see if I were to very closely examine the object with my bare eye. 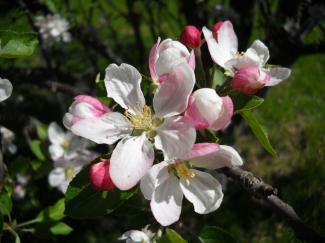 The attached photo for instance: notice the stamens and pistols of the apple blossom. Some are very straight while others may bend down, making it more difficult for a bee to get the pollen. Did you notice that there is a space between the petals on the blossom to the left? Not perfection, certainly. And one of the petals has an orange spot on the milky white. A blemish? And the “blurb” on the woody stem… we would never have noticed that had it not been for the macro. But there is something else. Look how the shadows play so softly across the petals. Look how the dark pink so lovingly embraces the tender buds yet to bloom. The beauty is heady enough to make us dizzy with spring delight! And so there we have the lesson from our macro lenses. They can show up every imperfection and each little blemish that we have tried so hard to cover up with our masquerade of faces we use for each situation we encounter during our days. A close look will reveal even pre determined imperfections we had no choice about at all. A big nose. Crooked teeth. A guffawing laugh. Balding hair lines. Bulging tummies. Sometimes we can be so merciless with ourselves! A close look can also show us what beauty lives along side all of the blips and blurbs. They co-exist to make us who we are! Have you ever considered that without faults you might never recognize your beauty? How will you focus today? Will you focus on your seeming imperfections or will you choose to focus on the beautiful soft spoken strengths? Consider your amazing beauty today. Look in the mirror and let yourself know how that you are a wonderful, vital and yes, beautiful being!